Onto the last of the foursome: Work in Progress 5th Release Sherry Wood. Like yesterday's WIP, it also has a light blue label. You can tell the two WIP5s apart via the bold stamp reading "Bourbon Wood" or "Sherry Wood". 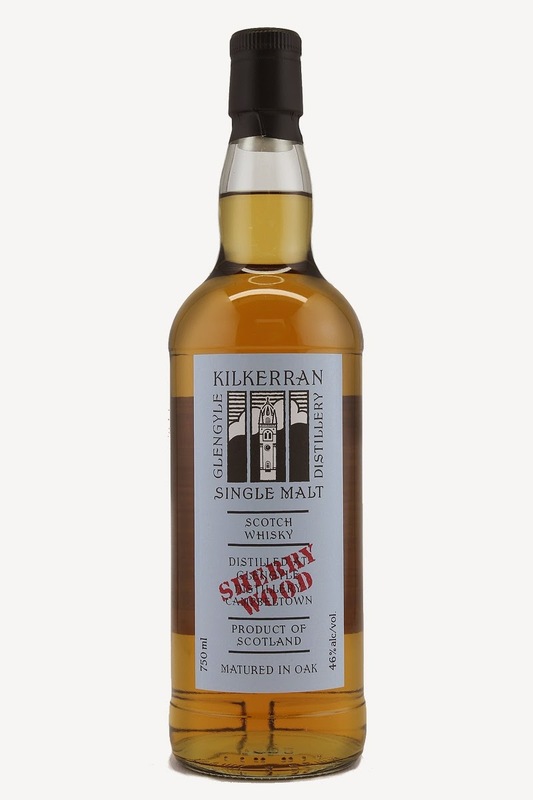 As I wrote yesterday, the Kilkerran brand (Glengyle Distillery) decided to shake things up in 2013 by releasing two WIPs rather than the usual one. Each was nine years old. One was aged in ex-bourbon casks, the other in ex-sherry casks. This would allow consumers to experience how maturation is proceeding into two type of casks, and it also allows them/us to buy more bottles of Kilkerran. Whisky Advocate gave Sherry Wood the Lowland/Campbeltown Single Malt of 2013 award, but I'm not going to give you the link because WA's award selections last year were often unintentionally hilarious. With an independent palate and opinion I trust more, Jordan of Chemistry of the Cocktail liked the Sherry Wood a lot. His palate takes to sherry better than mine, but I still respect his thoughts on booze of all sorts. The Sherry Wood is the odd one out in this week's group, with the other three having been matured either exclusively or mostly in ex-bourbon barrels. But at the same time, Kilkerran's producers had kept the oak element to a minimum thus far, so I hoped they'd do so with this one as well. The color is medium gold. Light for a sherried whisky. The nose still has that piney forest floor element I keep mentioning, which is comforting! It is matched with a nutty oloroso-type sherry, probably refill? There's rubber bands, dried cherries, pastry crust, and new car off-gassing. There are both grassy moments and chocolatey moments. Soft peat rumbles underneath. As for the palate, imagine Macallan 12 with much more barley and hay. It's creamy with nuts (almond paste and hazelnuts), brine, bitter peat moss, or is that moss-meets-baking-chocolate? Lots of almonds and hazelnuts in the finish. Salted nutty toffee, a dry sherry, and almond skins. The nose gets more herbal and farmy, along with anise and creamy sherry. It grows more candied with air exposure. The palate holds sticky sherry, black coffee, and sea salt. The finish is aromatic: flower blossoms and stewed fruits. Some salt too. A change of pace on the nose. Now there's moss, tar, and menthol to go with the oloroso. The palate also changes a bit. Caramel, toffee, sweet wine, and something slightly medicinal. The sherry shows up most in the finish. Sugared raisins and toffee. Like the other WIP5, this one swims well. Actually that helped this one gain a few extra points, as it opened in several different directions as I added more water, all of those turns proving enjoyable. I'll go a step further and recommend this with water as opposed to without. The Kilkerran character is still present in the nose and the sherry isn't too intrusive there. To me, the integration works better here than it does in some of the recent Springbank 10s. I reference Macallan 12 in the palate notes because I think this would be a fun alternative to the big Mac. When I've gone back to Mac12 recently, I keep finding it getting less rich and more narrow. While I don't know if this Kilkerran is "better" than Mac12, it does bring with it more dimensions and more strength. This WIP5 does have me wondering how it will continue to develop, because the optimist in me thinks this could get exceptionally rich even by age 12. Kilkerran has a great thing going with their single malts. For me, the point has come where they've passed Talisker (old stuff not included), as the Skye distillery descends and Glengyle ascends. What a great moment, wherein one can support a small business over a huge one, not just for philosophical purposes but also in terms of pure quality. Availability - Many specialty liquor retailers. Loved the slam on Whisky Advocate. They have become such a joke, haven't they? And they earn it more and more with every issue. This mag I buy for the photos, not the articles! They still have the occasional gem in there, like Fred Minnick's feature on LDI/MGPI, but gone is the time when Malt Advocate was the arbiter and forum of all things whisky. WhiskyFest tickets, anyone? This is a pivotal moment in whisky history so it saddens me that the majority of professional whisky writers have abandoned any semblance of journalistic integrity (or even general inquisitiveness). These were the writers that helped build my interest in this spirit, history, and industry. Without them, there would be no whisky on Diving for Pearls (for better or worse). But now, I won't renew any of my whisky journal subscriptions. As you mentioned, there's always an interesting article or two and lots of great photography in the Advocate. But all industry criticism has been abandoned. Why? It doesn't need to be cynicism from cover to cover, but mixing some challenges in with the gloss would lend a considerable level of quality to their content. There are three months between published issues, there's plenty to explore in that time. On a related note, the editor of Whisky Magazine just became the Global Ambassador for Grant's. Criticism of the industry? On your blog! No room for negativity in a magazine that wants to make men enjoy the good things in life - such as a limited edition, $4,995 bottle of whisky. And not as much because it would piss off Grant's - but because it would scare away Jaguar, Cartier, and American Express. For relaxing times - make it Suntory time! Your comment made me both very happy and very sad. I can't say I disagree with any of it. On a related note (again), Mr. Shanken was one of those taken in multiple times by Hardy Rodenstock's fake Chateau Lafites (see BIllionaire's Vinegar) and promoted the wines aggressively before the fraud was exposed. I just got my new Whisky Advocate in the mail. Unfortunately my comment was eerily prescient - see the article on fancy whisky bars on fancy golf courses, the article on what whisky lovers can learn from wine lovers, and the ads on watches and other finer things in life. Sounds decadent! I hope they keep their Whisky Auction Index going too. Then they can interview David Robertson about his $10 million Platinum Whisky Investment Fund, followed by an article about buying Mortlach futures. You *think* you are joking. Nice photos of the Mortlach expansion plus David Broom's evocative notes on the new Mortlach range (max score 94 or so). One interesting feature: the first (and last?) ad ever from MGP! That's as rare as an Apple ad, don't these things sell themselves? An MGP ad? I wonder if that was aimed at prospective craft "distillers" looking to start bottling a product. Because, as you say, MGP sorta sells itself to those who know.